In most of America, Memorial Day is celebrated by remembering and honoring those who have fallen in service to their country. In Hawaii, with its diverse population, many traditions become easily adopted and assimilated into the state’s rich culture, including Memorial Day traditions. One custom for celebrating Memorial Day in Hawaii is the placement of flowers and offerings on the gravesites of loved ones who served their country – and on the sites of others who have passed away. 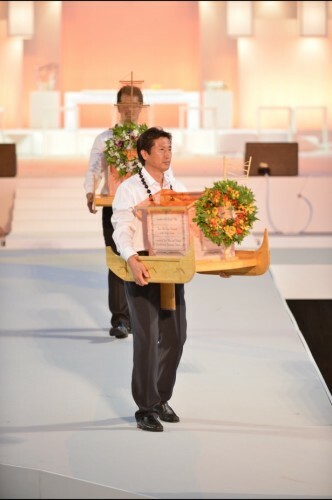 This tradition also incorporates a Lantern Floating Ceremony. With the wish of creating cultural harmony and understanding, Her Holiness Shinso Ito, Head Priest of Shinnyo-en, officiated the inaugural Lantern Floating Ceremony with floral presentation on Memorial Day, 1999. The event quickly became one of the most beloved gatherings in Hawaii. For the first 3 years, this Hawaiian event took place at Ke’ehi Lagoon on the south shore of Oahu. In 2002, it moved a few miles down the coast – to Ala Moana Beach – where it has taken place every year since. Pu – The sounding of the pu, or Hawaiian conch shell, sanctifies the area and marks the commencement of the ceremony. Oli – This Hawaiian chant calls the attention of all who are present to prepare their hearts to receive the importance of what will follow. Entrance of Lanterns – Six large Parent Lanterns carry prayers for all spirits on behalf of all people. Prayers are offered for victims of war, water-related accidents, natural and manmade disasters, famine, and disease. Gratitude is offered for all – even endemic, endangered, and extinct plant and animal life. These lanterns float with the hope of encouraging harmony and peace. Purification – Her Holiness Shinso Ito offers a blessing of the ceremonial area, the lanterns, all who are being remembered, and all in attendance prior to the floating of lanterns. Onjiki – This literally means “food and drink,” and the ritual offers spiritual nourishment to the souls of those being remembered. Sange – Since ancient times, flowers have adorned the path of honored ones. The scattering of flowers on the path symbolizes the love and respect that we offer to our loved ones. Shomoyo – This is a fusion of traditional Buddhist chant and Western choral harmony. Ringing of the Bell – The crystal clear sound of Her Holiness Shinso Ito’s bell focuses everyone’s thoughts and prayers, and it signifies that it is time to float the lanterns. Floating of the Lanterns – Lanterns are placed onto the water with wishes for peace and happiness of loved ones who’ve passed. The lanterns symbolize the unveiling of courage and hope in the hearts of those in the present. Those who would like to personally scatter flowers or float a lantern at the ceremony may visit the Lantern Request Tent at Ala Moana Beach on the day of the event. Participants can begin picking up flowers and a lantern at 10 a.m. All lantern parts are given in a carrying bag, and quiet space is provided for writing remembrances and assembling the lantern. The Shinnyo-en Lantern Floating Ceremony takes place at Ala Moana Beach on May 28, 2018. | 1201 Ala Moana Boulevard, Honolulu, HI 96814. Tel: 808.768-4611.